Rob Gast (right) stands with his fiancé, Matt Hall, at Ohio Stadium. 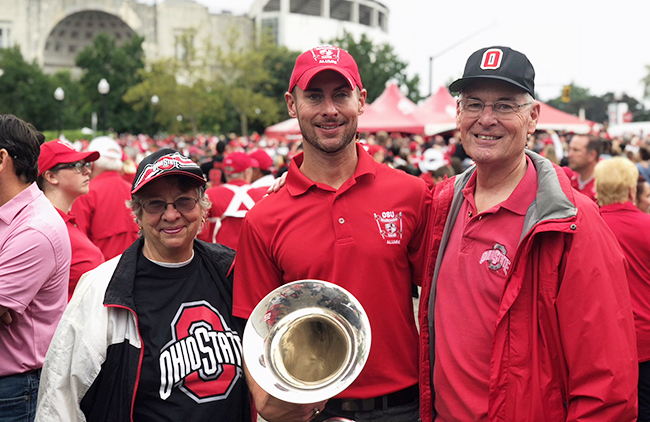 It was a brisk Saturday afternoon, and Rob Gast had just played the final note on his baritone to end The Ohio State University Marching Band (TBDBITL) Alumni Reunion halftime performance. It was indeed a highlight for many of the hundreds of band alumni who performed. But for Gast? It was a mark of triumph — a milestone forged at the end of a long, arduous journey that tested his resilience and grit. Only five years ago — May 14, 2013, to be exact — Gast, who graduated from Ohio State in 2003 and was a TBDBITL squad leader in M-Row, suffered a major ischemic stroke. The incident left him with aphasia, a condition that has no effect on intelligence but causes the loss of ability to understand and express speech. The stroke also caused minor paralysis in his right arm and wiped away his ability to read music. Rob Gast stands with his parents, Bob and Lynn Gast, in 1998. Gast’s stroke occurred on a Tuesday. He’d battled a major headache the Friday before and felt dizzy most of that weekend. The next Monday, his headaches and dizziness persisted, and he checked himself into a clinic, where he was told he was healthy and that his symptoms would hopefully subside. The next morning during a conference at his office at Abercrombie & Fitch, where Gast worked as a senior planner, Gast suffered the stroke. After the medical emergency, Gast undertook the laborious effort of relearning how to read, write and talk. A year after Gast’s stroke, he joined the Ohio State Aphasia Initiative, a program housed in the Department of Speech and Hearing Science that hosts structured group sessions to nurture and encourage communication skills. The sessions are supervised by Jennifer Brello, a speech pathologist and an assistant professor of speech and hearing science, and her graduate students. The program gives Gast an opportunity to not only work on his communication skills but to also teach back what he has learned during his recovery. Making and meeting goals has been an integral part of Gast’s rehabilitation. He’s turned into an avid runner and since his stroke, he has completed three marathons and a dozen half marathons. In October, he will run in the Ohio State 4 Miler, the largest four-mile race in the country. About a year ago, Gast set for himself the goal of marching on the field for the annual TBDBITL alumni reunion performance. He had to relearn how to play his baritone and read music. Rob Gast stands with his parents, Bob and Lynn Gast, before the Ohio State-Tulane football game on Sept. 22. While Gast’s speech has dramatically improved, he acknowledges that he still has room to grow. He has attended The Aphasia Center in St. Petersburg, Florida, three times and continues online therapy sessions through the center twice a week. He networks online with others who have aphasia through a Facebook group. He also volunteers at OhioHealth Riverside Methodist Hospital’s stroke ward, where he converses with stroke patients and others diagnosed with aphasia. Gast understands the struggles those struck with aphasia encounter. Being unable to communicate is frustrating, and relearning basic communication skills is difficult. That’s why he encourages others with aphasia is to continue having hope. Over the last five years, Gast has relied on help from his friends, his family and his fiancé, and he has come a long way. 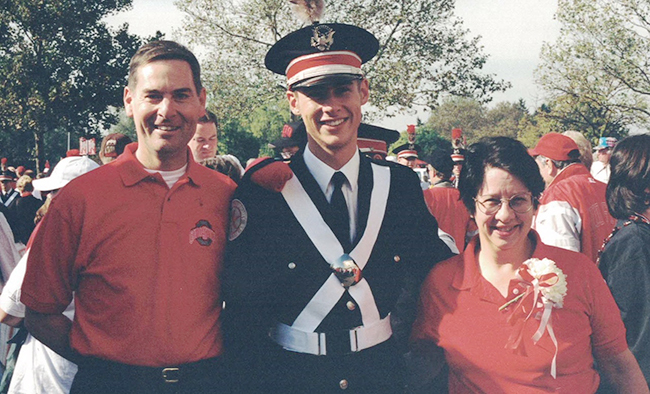 With support from programs such as the Ohio State Aphasia Initiative and an innate drive to set and meet goals like marching in the TBDBITL reunion, Gast is equipped to continue his inspiring recovery.